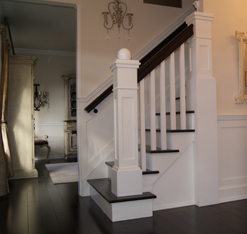 Romaniello's Custom Stairs and Rails have been in business since 1998 based out of New Jersey. As the owner I am personally involved in every job from the first initial meeting to the design, installation and completion of every job. We are known for our quality of work and attention to detail. We have built stair and rails from your standard remodel to one of a kind multi-million dollar homes. Our business is based on the satisfaction of our customers and the repeat business and referrals that we receive from them. Romaniello's has branched out under Romaniello's Custom Construction, LLC. Romaniello's Custom Stairs & Rails is fully licensed and insured. All our estimates are free. Get in touch with us today to get started!